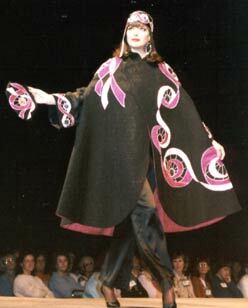 This all silk garment consisting of quilted cape and top, palazzo pants, purse and headpiece, was created for the 1997/98 Fairfield Fashion Show. Garment designs are original with the exception of the pants. Like a fuge, which has several melodic themes imitating and interweaving to form a single structure, the appliques on the black silk charmeuse flow from the shoulder down the front of the garment and across the bottom of the back and up to the other side, ending in ribbons at the right shoulder. The cape background is quilted over all in black sliver thread in a free-form branching pattern, forming a secondary theme to the composition. 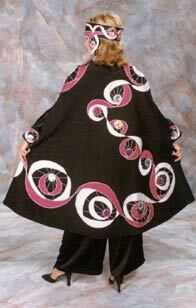 Inside, the reversible cape is lined with the same magenta silk jacquard used on the applique. The tunic underneath features another variation on the theme. This time, a more ribbon-like inter-twining of the applique is used to border the sleeves and bottom and go up the front side closure. Both the cape and the tunic have a Chinese mandarin closing.